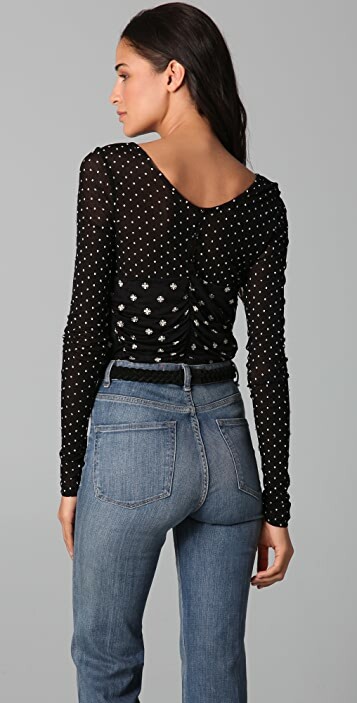 This scoop-neck Marc by Marc Jacobs bodysuit features a beaded, print mesh yoke and a pleated jersey body. 3-button closure and hidden zip at ruched back. 2-snap closure at inseam. Long sleeves. * Shell: 60% spun silk/40% modal. 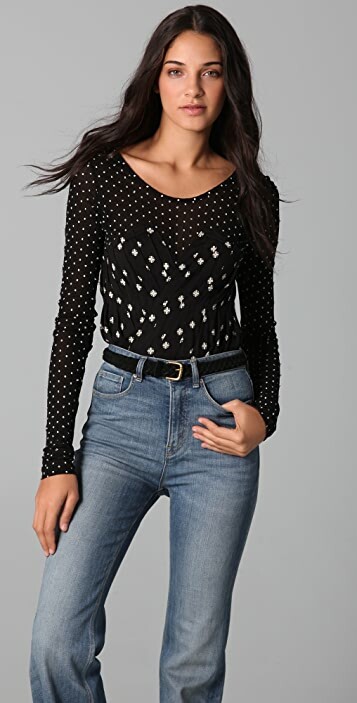 This bodysuit looks like something an off-duty model would wear. I wear an XS and the XS fits perfectly. I'm a big critic of sleeves, wanting them to be fitted, and these sleeves comfortably hug my arms. The beaded thing fell down as soon as I tried it on, also there were plenty already missing and some sewed again in an ugly way. It looks cheap. I'm XS in all marc jacobs clorhes, but I bought the S and it fits right, so the bodysuit, in order to feel comfortable and look good, must be sized up.